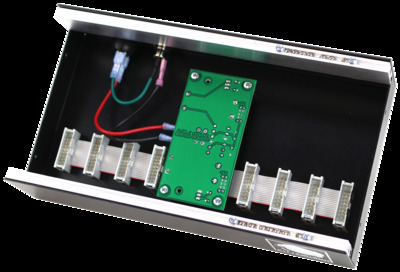 The Pittsburgh Modular Cell  is a small, expandable, desktop eurorack case and power supply. A custom designed, heavy duty steel frame matched with replaceable Pennsylvania cherry hardwood sides. The desktop cases are available in single and double row configurations. Frames and wood sides are available separately to allow for easy expandability and customizing. Single Row - Simple rectangle sides that support a single metal frame. Single Row sides are pre-drilled for easy assembly. A set of single row sides weighs 0.2lb. Double Row - L shaped sides that support two metal frames. Double Row sides are pre-drilled for easy assembly and can be used standing up or laying down. A set of double row sides weighs 2.2lb. The frame is made from heavy 16 gauge steel and covered with a durable black powder coating. A power switch and 2.1mm universal power adapter jack are included on the back panel. Cell steel frame weighs 1.6lb. The included Pittsburgh Modular power supply provides +12V @ 450mA, -12V @ 450mA. 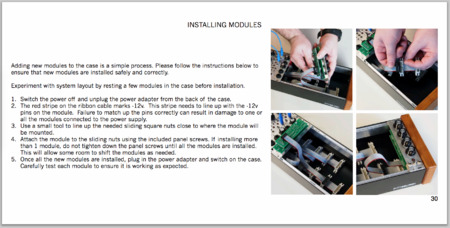 A custom ribbon cable delivers power for up to 8 modules using standard 16 pin power headers. 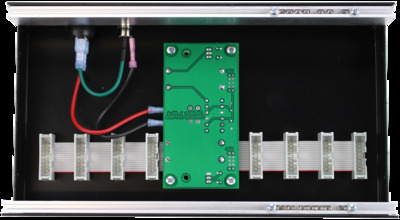 The power board uses an external 12V 1A AC/AC power adapter.